NYC, 02/15/2019, 2:00PM. 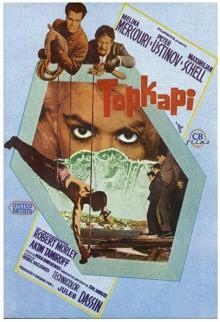 Topkapi (1964): A heist in Istanbul for Sultan's dagger. 120 min. Director: Jules Dassin. Starring Melina Mercouri, Peter Ustinov, Maximilian Schell. Peter Ustinov won the Academy Award for Best Supporting Actor for his role in the movie. Topkapi was shot on location in Istanbul, Turkey, in Kavala, Greece, and in Paris at the Boulogne-Billancourt Studios.